My mom got me the pedal on my Christmas list. A Dwarfcraft Total Spak Vibes. 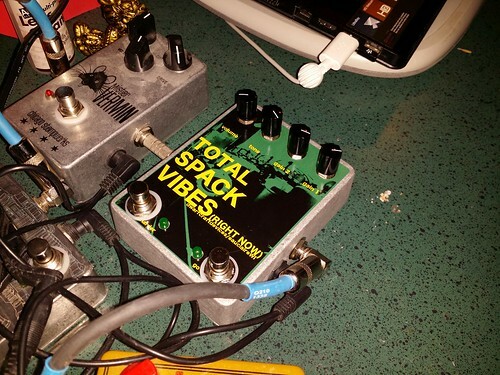 Totally excellent overdrive pedal. I like that it has two gain options with the second switch so you can kind of do rhythm/lead settings in one pedal. It has a huge sound range also. Super awesome. I am really happy with it. I actually sent it in to you guys to get the switch replaced or something. The bypass sometimes was muting the clean signal. I LOVE this pedal though. I really want to try it with my Airline style guitar. Dwarfcraft people were super nice and fast emailing about helping change the switch. I had an issue with my Fuzz Factory pedal and they are charging me $15 to fix it. I am pretty sure those switches don't cost me that much, and I know zvex doesn't pay retail for those switches. I know labor has value, but no warrenty? Dwarfcraft is far above them in service and I would love to buy another pedal from them. Stuff like that makes me pretty loyal to a builder. Very much appreciated! Now I just have to suffer until I can play with it again. At least I still have my diy Robot Devil for distortion.